In 2008, I worked on a Joint Light Tactical Vehicle proposal. Over a decade later, the Army will begin fielding this vehicle which took lessons learned from the Mine-Resistant Ambush Protected (MRAP) systems fielded beginning in 2007, and applied them to a replacement for the High Mobility Multipurpose Wheeled Vehicles (HMMWV). 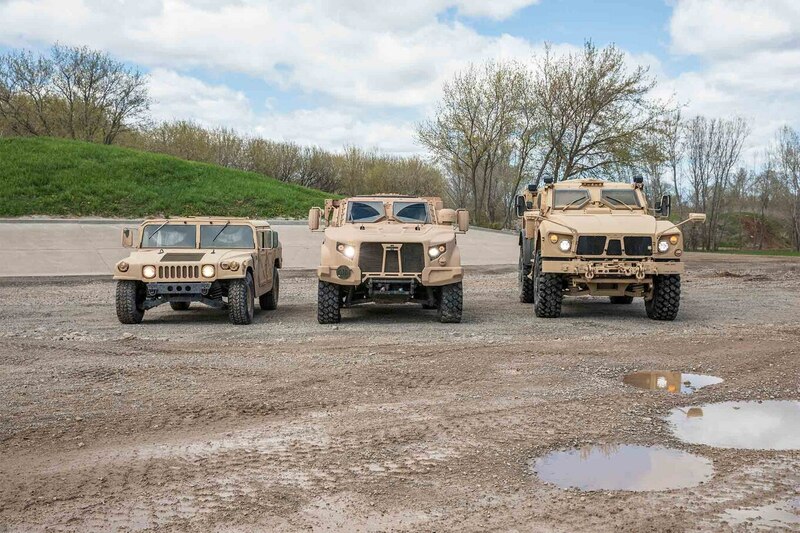 Based on a recent Army Systems Acquisition Review Council decision, the 1st Armored Brigade Combat Team, 3rd Infantry Division will Ve the first unit equipped and should receive it’s full complement of about 500 new JLTVs by the end of March 2019. Overall, the Army plans to field 49,099 vehicles across its Active, Reserve, and National Guard components, and the Marine Corps more than 9,000. The Air Force will also field the JLTV. This entry was posted on Friday, December 28th, 2018 at 20:00	and is filed under Mobility. You can follow any responses to this entry through the RSS 2.0 feed. Both comments and pings are currently closed. This is a great niche capability for advisers because of its protection, but where does this vehicle fit for conventional forces? Looks limited for expeditionary ops or power projection. While I am excited about the capabilities, where in Army / USMC formations will this be used? Way back when I was in a conventional heavy division (88-91, including Desert Storm), there would have been zero consideration of lift by helicopter or C-130, or amphibious. When we packed up and deployed, it was all convoy (wheeled vehicles) and rail / HETT (for tracks), to load on USNS Fast Sealift Ships and contract vessels out of Bremerhaven. That’s still pretty much how conventional heavy forces deploy. As far as fuel consumption of the wheeled fleet, that was of comparatively minor consequence in an Armored Division which has 50,000 gallon trailers continuously pouring fuel into thirsty M-1 tanks. Corps or higher could actually lay petroleum pipelines. Heavy logistics on a scale completely different from Airborne or Special Operations forces. Let me clarify that I am basing those statements on the assumption that it is similar in size and weight to M-ATV which it looks like. Or is there a significant difference between JLTV and MATV in size / weight / fuel use? It takes lessons learned from the M-ATV and other MRAPs to make a better Humvee per se. M-ATV was created based on lessons learned from MRAP. Curb weight of the JLTV is 14,000 lbs compared to the M-ATV’s 27,500 lbs. Please compare for your own edification. That was an interesting article. Funny the Humvee came in as second most reliable. While it seems the JLTV will be a great improvement, the part where they talked about the B level armor kit bothered me. Like with the Humvee, will they test and evaluate the system based on it base model only to make the Add on B level Armor the standard? Will doing so make the JKTV into its saggy axeled predecessor? Over burdened? I hope it was tested heavily in the B level armor mode as well. Either way it’s time for a change.